Our exceptional, friendly team is our greatest asset. 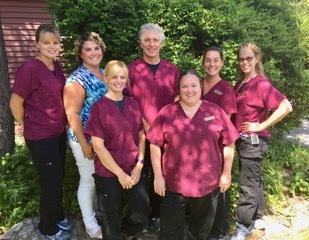 Our dental assistants, Missy and Andrea, and our hygienists, Bridget, Dori and Jessica are licensed professionals who pride themselves on staying on the cutting edge of dentistry and patient communication. At the front desk you will find Michelle who genuinely cares about helping our patients navigate insurance and financial matters. We are committed to providing our patients with ideal, compassionate and exceptional care at every stage of your visit, from a warm greeting at the door, through to treatment, and to arranging future visits. We are excited about what we are doing, have high standards of quality and integrity, and are motivated to achieve the best results for our family of patients. We are dedicated and determined with one primary goal—your utmost comfort! We feel it’s important for you to understand the treatment you’ll be receiving so that you can relax during your visit.